Beautiful, independent holiday house with private pool at Lazise with panoramic view over Lake Garda. The house is located in a tranquil area in the near of the small characteristic town of Lazise and owns a large, private garden. The holiday house is particolarly suitable for families who may appreciate the fenced garden for their pets. In the outdoor spaces you will find a jacuzzi, and in addition to this some childrens' games inside and outside. Two bedrooms are in the basement. 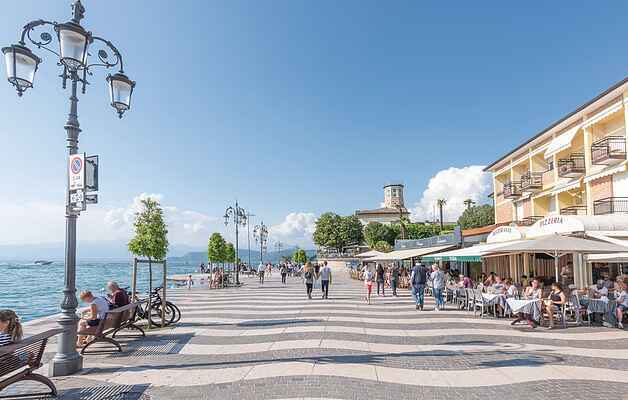 The place is ideal for all those who dream of a relaxing holiday, staying not too far away from many of the interesting small towns around the lake with their nice shops and restaurants. By car you easily reach all the interesting places of that area, including some well-known amusement parks. The area is ideal for all those who like to practice water sports, trekking, mountain bike and golf. The beautiful city of art Verona is at 25 km only, Mantova is at 30 km ca. and the wonderful city of art Venice is easily reachable by train (next train station in Peschiera del Garda). Upon request and payment on the spot you can book private Yoga lessons and massage at home, a private cook service, excursions with mountain bikes, climbing, horse riding and fishing by boat. At abt. 4 km distance IVG353 and IVG393 which are owned by the same house owner.